A telephone made from soup cans and string was an amazing thing when it was first shown to me. It was the kind of thing that made you believe magic was real. It was a lot of fun to play with until we got walkie talkies. Being able to talk around corners turned out to be much cooler. I remember thosse things, never tried them. We were planning on doing this at the Brewers game on Monday so my mom could talk past like 8 of us to my brother, but unfortunately we lacked string. I wasn’t aware Biff knew anyone. Haha, I like this one a lot, I love how Biff’s mouth looks here, a lot more expression than usual somehow, I think it’s cause it’s only long on one side, don’t change it!. Soup can phones, great stuff. Since everything is going wireless these days, I’d love to see a wireless soup can phone. 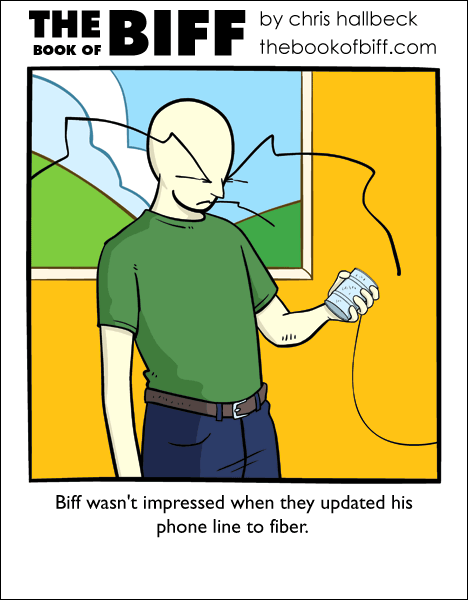 Fiber optic, Biff! Fiber optic! I hate to think how much they charged him for that. well, you’re gonna need quite a lot of string to call long distance. Biff should lease his eye brows to the phone company. I was never really impressed by the soup-cans-and-string telephone, because we were only given enough string so that when one person talked into it, the other person could hear him even without the soup can. I’ve never actually seen a soupcanstring phone, it sounds like something that could never ever work to me. Someday, I’m going to have to make one and get a friend to humor me with it, just to see if they actually work. I’ve never tried those. I’ve wanted to but never had the materials when I thought of it. I don’t see how it would ever work though. Maybe just because you can hear the other person even without the soupcan and string. The closest I ever came to that was in 3rd or 4th grade when we had to construct working electric telephones using parchment, cardboard, a magnet, a metal stand, some powdered graphite, some wire, and a dry-cell battery. Believe it or not, they worked; but the sound quality wasn’t the best. String can phones work suprisely well. I have a nice rollover plan and no fuss with text messages or voicemail! Next time, Biff, ask what KIND of fiber you’re getting. I think I would have preferred the soup can string phone to the walkie-talkies we got. The walkie-talkies we got only worked when we were so close that we could hear each other anyway.